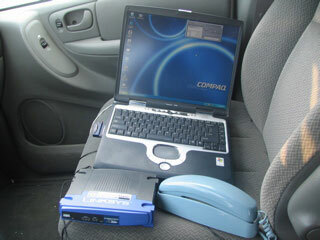 This guy made a VoIP over EVDO phone call in his car using Vonage. Good stuff! I love this quote: "I got some really strange looks as I held this old fashion POTs line to my ear while parked in a parking lot. People walking by probably thought I was on the strangest cell phone ever." minutes - so it is a way to make unlimited voice calls. I don't think they will like that too much." Good point... Although, I bet the carriers would be ecstatic if you paid $30-$50 per month for cellphone voice service and another $70-$80 for a EVDO data plan. Check out the VoIP over EVDO article. This guy made a VoIP over EVDO phone call in his car using Vonage. Good stuff! I love this quote: \"I got some really strange looks as I held this old fashion POTs line to my ear while parked in a parking lot. People walking by probably thought I was on the strangest cell phone ever.\"
\nminutes - so it is a way to make unlimited voice calls. I don't think they will like that too much.\"
Good point... Although, I bet the carriers would be ecstatic if you paid \$30-\$50 per month for cellphone voice service and another \$70-\$80 for a EVDO data plan.